It will be hard to convince you of the benefits of coaching if you are not actively open to your own personal growth and development or that of others around you. I can only explain that I now fully recognise the benefit that coaching will bring you through my own personal experience. Ten years ago, coaching supported me through a life changing business & personal transition. I went on to run my own consulting company. This was busy, successful and very rewarding. Not only financially rewarding but personally rewarding. My coach helped me to really become self aware, identify my strength areas and cross check this with trusted others around me. I subsequently went on to structure my role within the company around these strengths and became more comfortable letting others play to their strengths. This action lead to a good functioning balanced team and a massive reduction in my stress level which remains with me today. I became fascinated in the power of coaching and am now a Business & Executive Coach, accredited by the ICF (International Coaching Federation). I now want to assist people like yourself to identify a life & career path, overcome your barriers, reduce stress and fulfil your aspirations. The coaching process I follow is independent, confidential, non judgemental and has strict ethical guidelines (International Coach Federation, the main regulating body for the coaching profession worldwide.). Take a look at the testimonials from my clients – that is the best way I can explain how you might benefit. Don’t just take my word or that of my clients though. 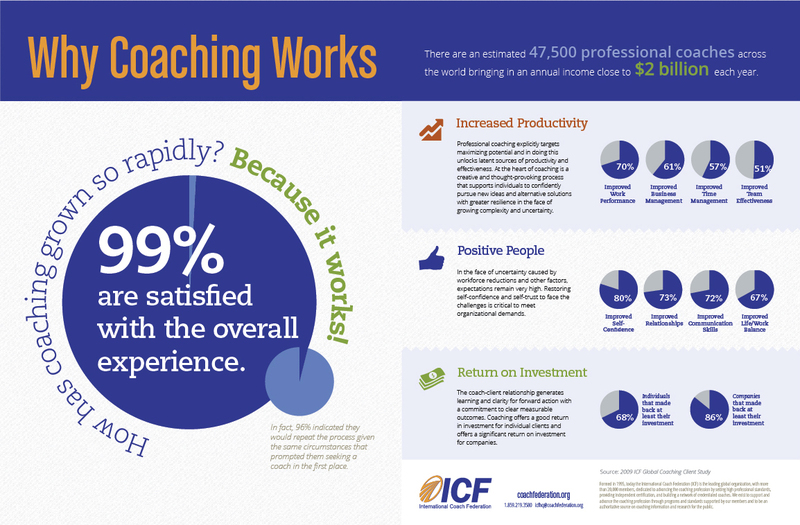 Take a look at the statistics from an independent survey conducted by Price Waterhouse Coopers on behalf of the ICF, the largest global coach accrediting association.